During that decade I managed a repertory cinema here in Richmond (the Biograph Theatre) and had the sweet opportunity to watch that era’s best movies over and over, for free. Studying those screenings was mostly a delight. On the one hand, to compare a whole decade’s worth of feature films with another’s seems like an overreach. The category is just too broad. On the other hand, opinionated film buffs will use any excuse to make such wall-to-wall comparisons. Obviously, each decade’s best movies are worth watching. But the American films of the 1930s, once sound was a given, are special because during the Depression the Hollywood way of making features in the studio system was perfected. It was a linear storytelling style more connected to the stage than to notions about composition within the frame and fragmented plots, as with some of the best European films. In Hollywood the top movies of the ’30s depended a great deal on good scripts and even more on stars/celebrities. No one so cared much about auteurs in those days. Those cats gainfully employed by the movie-making machine were glad, glad, glad to have jobs. Please note that I didn’t mention “Gone With the Wind” or “The Wizard of Oz.” Don’t need to see either of them again. “Duck Soup“ (1933): Directed by Leo McCarey; Cast: Groucho Marx, Harpo Marx, Chico Marx. 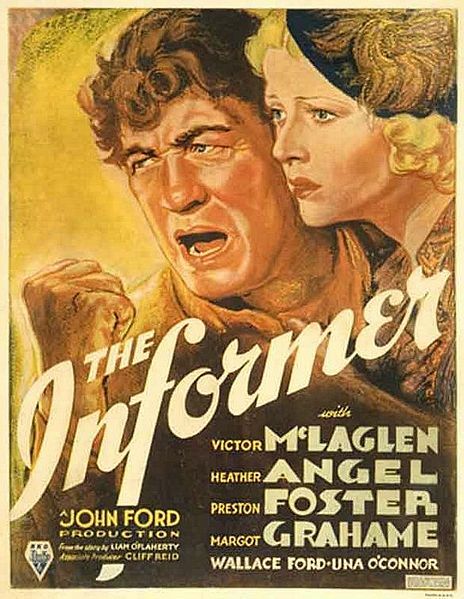 “The Informer” (1935): Directed by John Ford; Cast: Victor McLaglen, Heather Angel, Preston Foster. “Libeled Lady” (1936): Directed by Jack Conway; Cast: William Powell, Jean Harlow, Spencer Tracy, Myrna Loy. “My Man Godfrey” (1936): Directed by Gregory La Cava; Cast: William Powell, Carole Lombard, Alice Brady. “Stage Door” (1937): Directed by Gregory La Cava; Cast: Katharine Hepburn, Ginger Rogers, Aldolphe Menjou. Yes, I have revealed my weakness for that era’s comedies, especially of the screwball persuasion. In truth, this week’s list was prompted mostly by my urge to promote “The Informer,” a great flick I feel is overlooked today. Next week I’ll name my favorite films of the 1970s. This entry was posted in Film, Lists and tagged Aldolphe Menjou, Alice Brady, Carole Lombard, Chico Marx, Duck Soup, Five Film Favorites, Ginger Rogers, Gregory La Cava, Groucho Marx, Harpo Marx, Heather Angel, Informer, Jack Conway, Jean Harlow, John Ford, Katharine Hepburn, Leo McCarey, Libeled Lady, My Man Godfrey, Myrna Loy, Preston Foster, Spencer Tracy, Stage Door, Victor McLaglen, William Powell. Bookmark the permalink.